This is all I thought about during the weeks leading up to the incredible Bologna Children’s Book Fair. I was SO EXCITED. 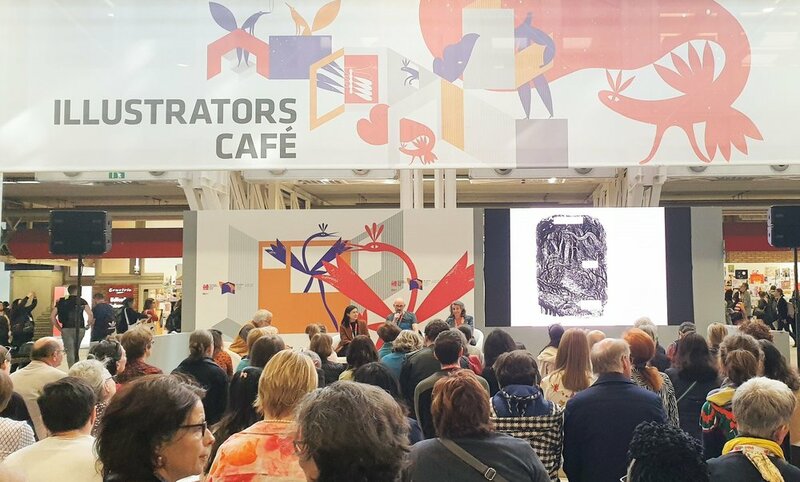 Myself and fellow illustrators, Fiona Gowen and Sue Hall, decided this was the year we’d venture into the world of BCBF and see what all the fuss was about. We’d read dozens of blog posts and articles, detailing how manic, huge, and overwhelming the convention is. But alongside that, also how inspirational, invaluable, and exhilarating it is. These were such a MASSIVE help in preparing for this expedition. But it’s still incredibly hard to work out exactly what we needed. Everybody’s reason for going to BCBF seems to be different, so knowing what others’ prepared with did help but it wasn’t a clear answer. ‘Leavers’, which were small packs I would leave with people I wanted to get in touch with. COMFY SHOES. SO MUCH STANDING AND WALKING. OMG. Learning basic Italian. Super easy and super considerate. I used Memrise. More business cards! Needed at least 100. Better knowledge of who was exhibiting and who I would like to talk to. Larger prints and more interesting methods to display business cards for the illustrator wall. - Next year, I’m going to go all out with my display! 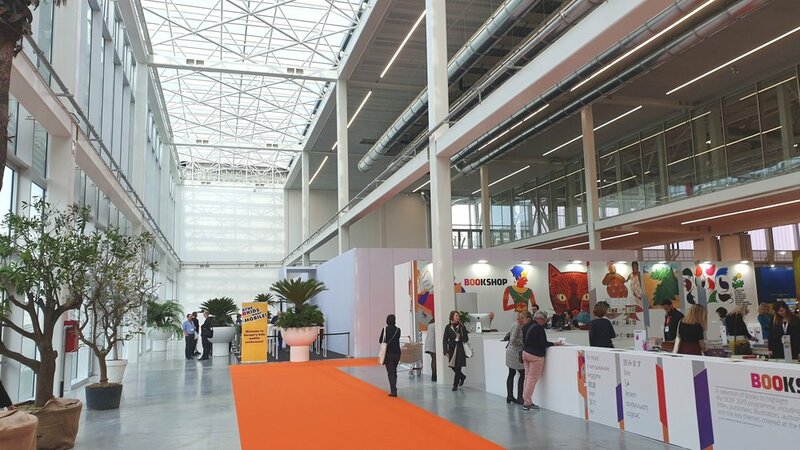 We thoroughly approached BCBF 2019 as a trial run, to see what we have done right and what we could change for next year. Considering our total lack of experience with this or any other convention/fair of it’s size, I think we did pretty damn well! Having never been to any convention of this scale, never mind BCBF, I was not prepared for quite how much was going on. The statistics released recently give a good idea of the size of it all. Now with the knowledge of the size of the thing, we rightly chose to treat day one as a recon mission. Scope the whole place out, make a mental note of key stands and people we would like to visit again, get a rough idea of how the entire event was laid out. This was a huge help in the coming days as a lot of what happens at BCBF is very timing dependent, so you need to be on the ball as much as you can. We arrived in Italy on the first day of the fair, which in retrospect was probably cutting it a bit fine. The illustrator walls were already full, the footfall already high, and queues for gelato were there (we would have preferred there be no queue and an instant scoop-to-mouth interaction instead, but nothing’s perfect). Next year we plan to arrive the day before, giving us time to dump luggage at the AirBnb, get our bearings, then get to the fair nice and early on the day it opens. Our first impressions were certainly clouded by travel tiredness and aching feet, but nonetheless we were so excited to be there. The sheer amount of work and effort put into making the fair look and feel as welcoming and creative as possible was incredible. Everything looked so slick and well designed. The illustration exhibition in the first hall was especially amazing. The illustration work had been cleverly displayed under perspex instead of mounted on walls, which I felt gave a much better impression of how illustration work is consumed in the ‘real world’. The quality of the work was incredible, with so much diversity in both the illustrations and illustrators. It was such a perfect welcome into the hustle and bustle of the event. After our scope out of the fair, we - obviously - ate some fancy pizza and crashed down into our beds. I don’t think I’ve ever slept so hard in my life. After our recon mission on the first day, we spent the rest of the time divided between talks, portfolio reviews, and dropping in on as many people as possible. I did struggle a bit with computing quite how many publishers, agents, artists, and other wonderful things were right in front of us so it was a bit tricky to work out where to start. But between looking for the people I knew I wanted to talk to and the events/talks I wanted to attend, we filled the gaps organically. We spent a lot of our time in the Illustrator’s Survival Corner, at the far end of building 30, attending some fascinating and hugely useful talks and portfolio reviews. The events guide was absolutely bursting with incredible things to attend, it was almost frustrating to be just one person! But we really did choose well! One particularly inspiring and helpful talk was from students at the Cambridge School of Art. They spoke very frankly about their specific struggles with their practice and how digital techniques have helped them overcome these issues. 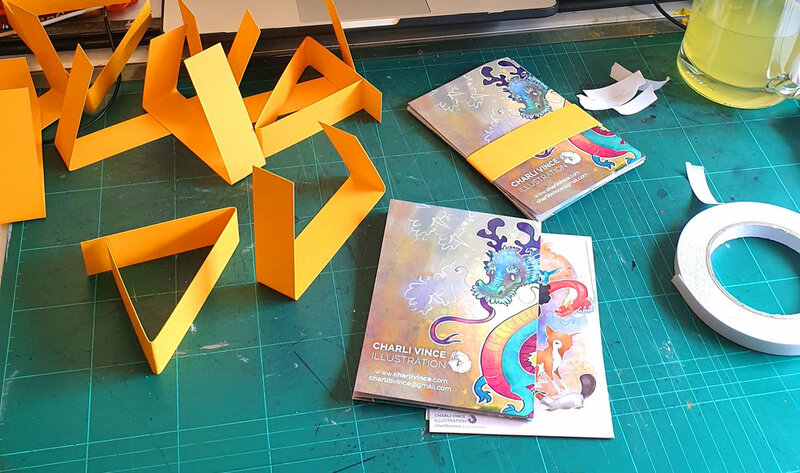 Whether it was arranging the layers of a print on Photoshop before creating physical prints, working out colour palettes, or ordering pages for print. Sophie Burrows was one of the speakers for this; she described in great detail how she maintains traditional textures and aesthetics whilst using digital mediums, something I struggle with a lot. So it was especially great to catch up with her afterwards for a chat about it all. It was no surprise the The AOI also imparted some invaluable advice and knowledge to the huge crowd that gathered for their talk. The brilliant Georgia and Derek were representing The AOI this year and they did an amazing job, with every seat full and every brain buzzing. I caught up with them both after their talk to touch base and introduce myself as founder and co-organiser of Norwich AOI. Myself and Fiona Gowen (also Norwich AOI co-organiser!) had a great chat with them about the new paths The AOI is taking and it’s really exciting new #NotaHobby empowerment campaign that I am SO VERY on board with. I’ve been a member of The AOI for many, many years and their support and resources just keep getting better and more valuable every single year. 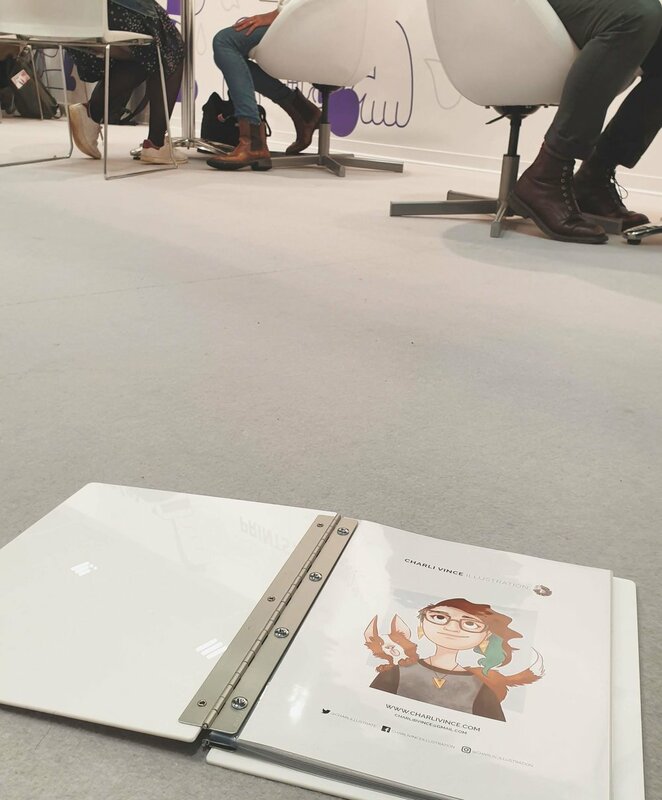 One of the main things I desperately wanted to do at BCBF was grab myself a portfolio review. 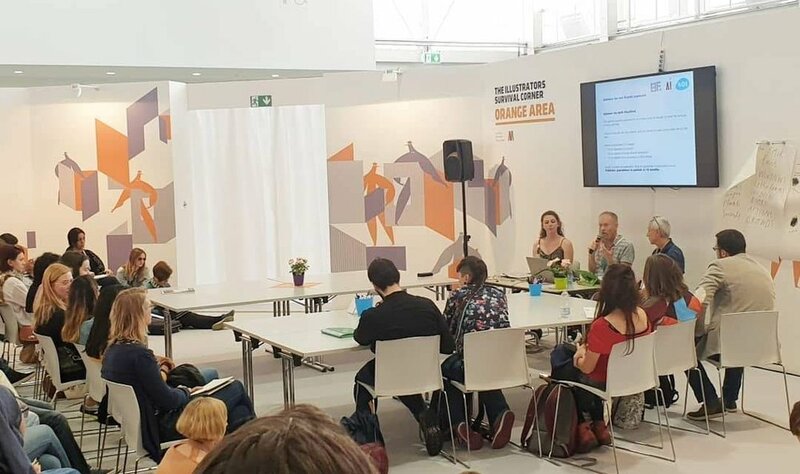 The portfolio reviews at BCBF are coveted little gems, which became immediately apparent when we saw our first queue… Needless to say, the reviewers were in high demand, which makes sense considering there were some big names in there. Rob Biddulph, Daria Kirpach, Bright Agency, NoBrow/Flying Eye Books, and Coccole Books to name a few. Accompanied by many sprinting, portfolio wielding illustrators, we rushed to the Illustrator’s Survival Corner first thing on Wednesday morning to try to get on the signup list for a review. Luckily, I managed to bag two! The fantastic Rob Biddulph and Daria Kirpach. The advice they both gave me was incredibly helpful, with suggestions surrounding variation in storybooks, character design sheets, and feedback on the range of skills demonstrated in my portfolio. I went away from these reviews with a notebook page full of scribblings and a hundred new ideas for directions to take my work. Later on in the event, on the final day, we even managed to get 5 minutes with the amazing Sam Arthur, CEO & co-founder of one of my favourite publishers; NoBrow Press & Flying Eye Books. Another fantastic review with some brilliant advice to take away and apply to my practice. I’m hugely grateful for these leading names in the industry to take the time to look at new, emerging, and professional illustrators’ work. As incredible as the fair was and as much as we loved walking round all the stands, talks, and exhibitions, we also needed to eat and relax every now and then… I know us artists normally forget to do those sorts of things, but we really did need to refuel after many hours of being in the fair. The city of Bologna was amazing to wander around. We spent our evenings visiting Bologna square, eating a variety of different pastas (my favourite food in the whole world), visiting the incredible Libreria Per Ragazzi bookshop that everybody always raved about, and finding the tackiest “I just visited Italy!” magnets to bring home. I would put a list of all the places we visited but the best places were the ones we found by accident. The little lanes off of the main square have some gorgeous little restaurants with the best tortelloni I’ve ever eaten. Folks at the fair will know the very best places for art supplies, bookshops, and galleries. And you are never too far from a good gelato shop (even though the fair itself has some amazing gelato stands). Using our evenings purely to wander Bologna and take in the sights (and food) really helped keep our brains functioning and refreshed, ready for whatever the next day held for us. 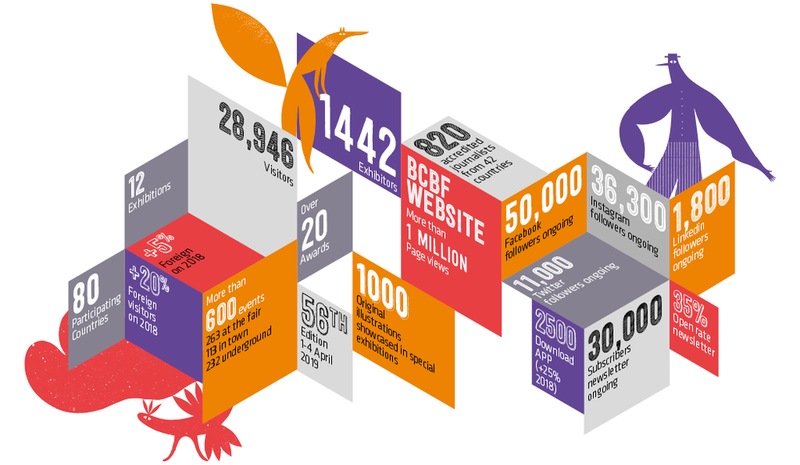 The immersive nature of BCBF helped with so many aspects of my professional practice. From overcoming the constantly encroaching imposter syndrome creatives face on a daily basis, to feeling like part of a vast and colourful community in kid lit. Sure, I left the event feeling tired, worried I’d missed something, and with a slimmer looking bank account, but the things I gained far outweigh the efforts and costs involved. Meeting people was a huge part of BCBF for me. The AOI team, Bright Agency after their talk, a huge host of publishers, NoBrow, dozens and dozens of fellow illustrators, my circle broadened a lot. It can be so hard to stay on top of trends and fashions within the creative industries, they go out of date so quickly. But having the opportunities to look at dummy books, unreleased titles, and the new catalogues for publishers almost felt like a brief look into the future. I left with no shortage of ideas and plans, that’s for sure. Whether it’s ideas for visuals or narrative, being around nothing but illustration and stunning stories helped focus my mind straight away and new paths and plans could form easily. Yes, totally different to contacts. Connections to me means the fellow illustrators I chatted to, the people who were in my position, the people who I could immediately relate to and who I WISH lived closer to Norwich so they could come along to the next Norwich AOI event! It was such a warming and nice experience to speak to so many creative people. It reenforced my already strong belief that creative communities and connections are vital to the wellbeing and success of artists of all fields. That most definitely is not an exhaustive list of the reasons why attending BCBF 2019 was so incredibly worth it. Each ending to a day felt like a satisfied sigh. We’d ventured so far out of out comfort zones and been rewarded for it each time. The moment I got on the plane to head back home, I started planning what to do for BCBF 2020. We’re coming back for ya, Bologna. That’s for sure.